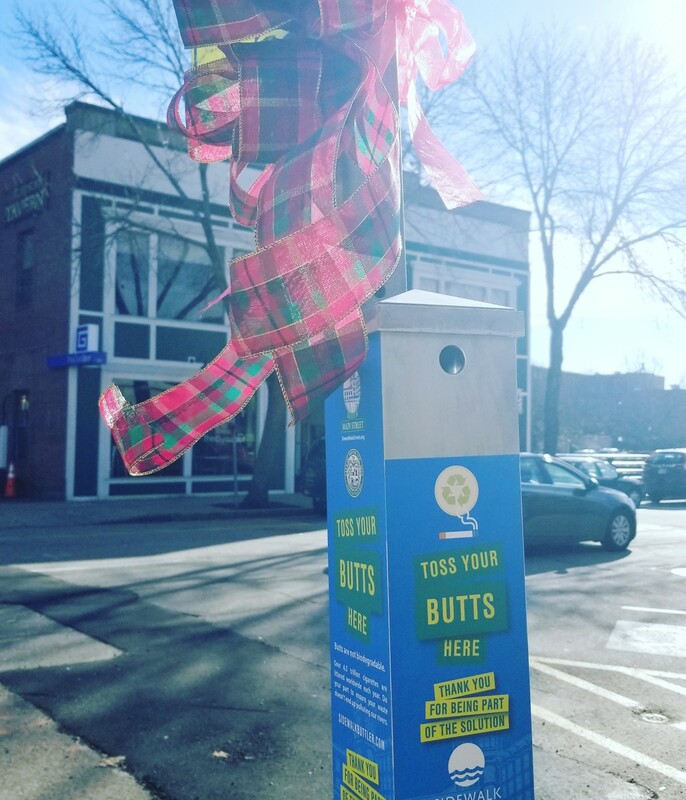 The cleanliness of Dover’s downtown streets should improve just in time for the holiday shopping season, as a partnership between the City and Dover Main Street has resulted in the installation of 50 “Sidewalk Buttlers”—pole-mounted metal receptacles for cigarette butts. The units were installed along the downtown’s busiest sidewalks from Silver Street to Broadway at the end of November. With smokers’ cooperation, not only will many thousands of non-biodegradable butts be removed from underfoot and, ultimately, the Cochecho River and Atlantic Ocean, they will also be recycled into useful products. As each unit—each of which holds approximately 700 butts—is emptied, the cellulose acetate butts are boxed for free shipping to the TerraCycle recycling facility in New Jersey where they become a new form of plastic and are upcycled into park benches, picnic tables, and other items. The Sidewalk Buttler was invented and first launched in Portland, Maine and has since spread to cities of all sizes throughout the country. The innovative design of a rectangular aluminum box reduces fire concerns and attaches to existing poles at eye height, eliminating the ground-level hazards created by other receptacles. Attractive, eye-catching blue-and-green labels were designed by Dover Main Street, and the 50 durable units were donated by the organization as its annual gift to the city. The City’s waste collection contractor is responsible for gathering and shipping the butts. Within a week of installation, the City’s Community Services Department reported that units were beginning to fill up. Fifty Downtown Buttlers, at a capacity of approximately 700 butts each, will represent 1,750 packs’ worth of cigarette butts diverted from the environment each time they fill up.